There is a great prize to be won too, so come on and join us in the fun! Very beautiful and so classy! Thanks for joining our challenge this week with Kraftin Kimmie Stamps. Beautiful card Sherry, thanks for joining us at CAS-ual Fridays. A very pretty vintage style card Sherry..beautiful. What a lovely image...beautifully accented and designed! Thank you for sharing with us at Fussy and Fancy "Flowers"...good luck and I hope that you will join us again soon! WOW - this is such a stunning card. That image is gorgeous and so are those flowers. What a gorgeous vintage card! I love that image and the added flowers! Thanks for joining us at Alphabet Challenge Blog. 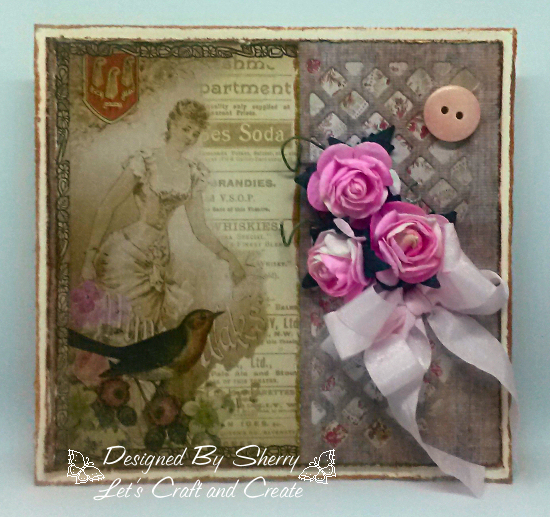 Lovely shabby vintage card! Thanks for playing with our CAS-ual Fridays challenge and Good luck! This is lovely, Sherry. The vintage feel to this is so sweet and the flowers are a lovely touch. Of course, it wouldn't be complete without a bow, and the seam binding is such a sweet accent. Thanks so much for playing along with us. I hope that next time you think of ribbon, you will think of Really Reasonable Ribbon for all your twines, trims, ribbons, flowers, and more. We look forward to having you play along in our challenges again soon as well. Oooo….and don’t forget about our Blog Hop on the 13th. One lucky person wins the Ribbon Club Assortment, and it could be YOU this month. I hope you will join us. P.S. No need to leave me a reply/comment here. I'm not sure if you're aware, but bloggers don't see (or even get notification) these comments. The best way is to visit our blogs and make new friends, which I hope you will do. I love to visit others' blogs often and have others visit me as well. I'd love to have you visit, follow, etc. I look forward to visiting your blog again soon. Thanks so much for sharing your talents out in blog world.